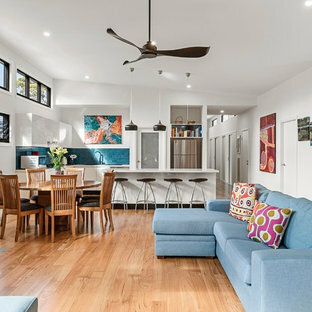 This is an example of a contemporary formal open concept living room in Wollongong with white walls and grey floor. 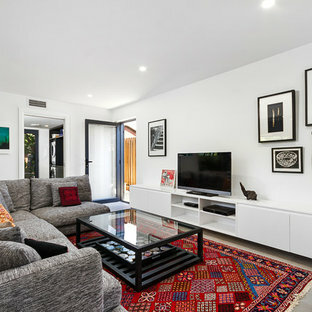 Design ideas for a contemporary enclosed living room in Wollongong with white walls, a freestanding tv and grey floor. 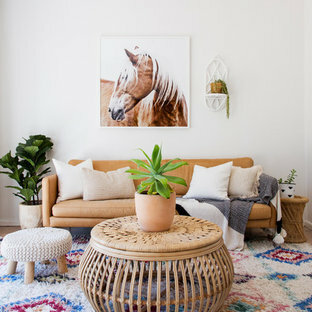 Inspiration for a beach style open concept living room in Wollongong with white walls, light hardwood floors, no fireplace, a wall-mounted tv and brown floor. 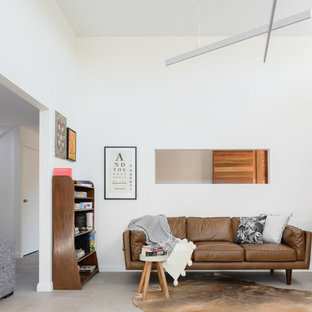 This is an example of a mid-sized contemporary living room in Wollongong with concrete floors. 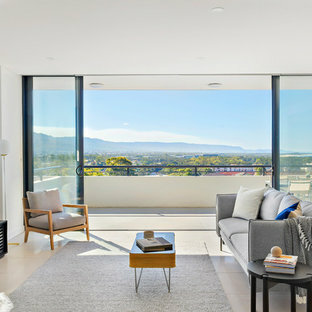 Inspiration for a contemporary living room in Wollongong with white walls, light hardwood floors, no fireplace and no tv. Contemporary formal open concept living room in Wollongong with beige walls and beige floor. 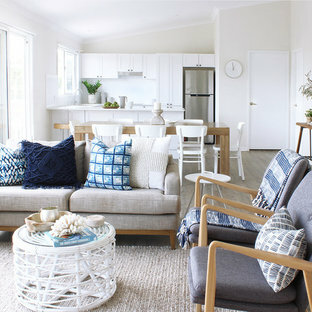 Design ideas for a beach style living room in Wollongong with white walls, medium hardwood floors and brown floor. Contemporary open concept living room in Wollongong with white walls, light hardwood floors, a wood stove and beige floor. 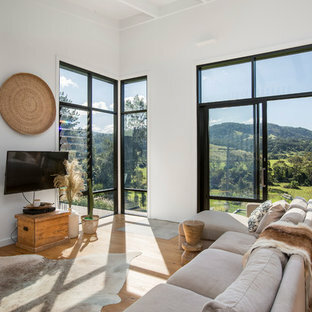 Kathryn Bloomer Interiors was hired to furnish and decorate this holiday house on the South Coast of NSW. The look for this small beach house needed to be casual & modern with a mix of colour tones to keep it looking bright and fresh. Large contemporary open concept living room in Wollongong with white walls, medium hardwood floors, a freestanding tv and brown floor. 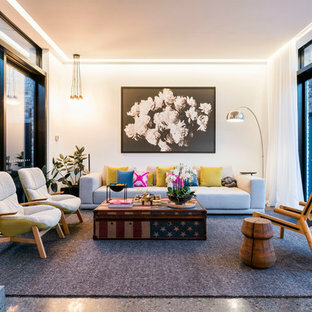 Inspiration for a contemporary living room in Wollongong. Design ideas for a contemporary formal open concept living room in Wollongong with white walls, light hardwood floors, a two-sided fireplace, no tv and brown floor. Mid-sized contemporary open concept living room in Wollongong with a library, white walls, medium hardwood floors, a standard fireplace, a plaster fireplace surround and a freestanding tv. Design ideas for a contemporary open concept living room in Wollongong with white walls, concrete floors, a freestanding tv and grey floor. 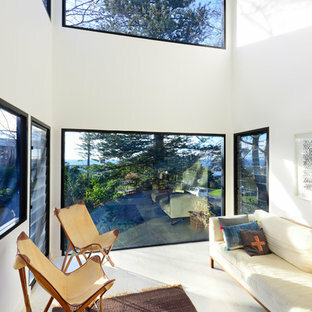 Inspiration for a beach style living room in Wollongong. Inspiration for a mid-sized country open concept living room in Wollongong with beige walls, a standard fireplace, a stone fireplace surround, concrete floors and no tv. Design ideas for a large country open concept living room in Wollongong with white walls, light hardwood floors, a standard fireplace, a plaster fireplace surround, a freestanding tv and brown floor.